> NETIQ > Can You Shut Down an Advanced Persistent Threat Before It’s Too Late? Sophisticated hacks, known as advanced persistent threats (APTs), often use stolen credentials to evade security measures. So how can you be sure it’s really your user logging on? Learn how to spot suspicious activity before it’s too late. Advanced persistent threats have evolved. They now use sophisticated tactics to circumvent security policies. Whether people are trying to use spear-phishing scams or other means to try and hijack insider credentials, your defenses will need to adapt to the new threat landscape or you’re risking the consequences. 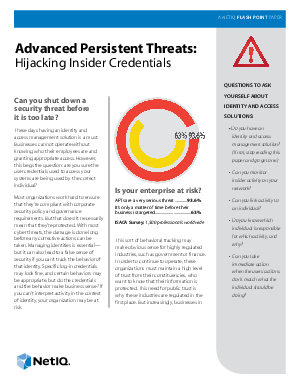 In the NetIQ Flash Point Paper Advanced Persistent Threats: Hijacking of Insider Credentials, learn what the most harmful threats are and how you can protect your organization from them. Don’t let your guard down. Learn what you need to defend yourself today.